My first contact with the field of tapestry was when I was studying at the art school. Of course I had seen a few tapestries before, but I never thought about how they were made or that tapestry could be an art on its own, although it’s even called painting with yarns. This is probably the first reflection that occurs to a person who is not familiar with this subject, but I understood that it is very easy to change this thought pattern. I felt the mystique and charm of tapestry as soon as I started my textile studies. 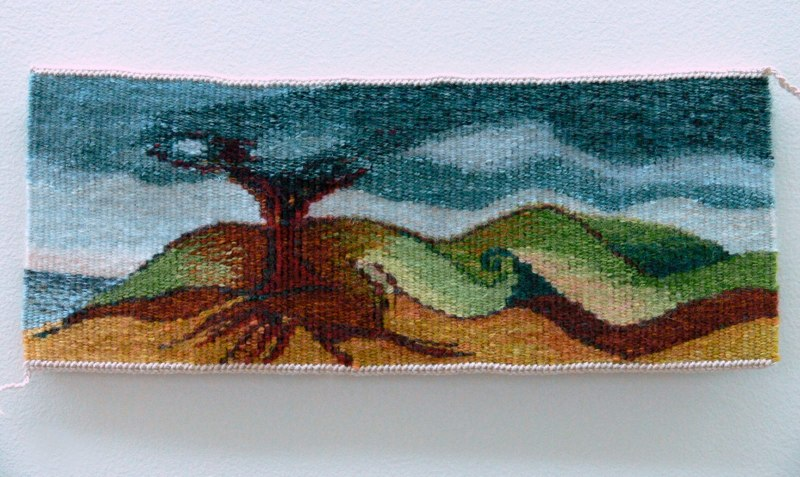 I got a wow effect when I saw very different works with different approaches, topics, and ways of exhibiting and discovered that there is a very creative approach to tapestry weaving. It immediately made me think about how I would express myself through tapestry. It inspired me and made me interested in the topic. It seemed to me that tapestry was like some sort of a holy grail both for me and for my course mates ‒ something that a real textile designer should make at least once in his or her life. Moreover, this should be done very thoughtfully and as if you are going to put your soul in it. What is important and interesting for me is that everyone can find their own way of weaving tapestry. This is certainly the most exciting thing that I observe in other’s work, namely, which materials and techniques others use and how these materials and techniques help them to convey certain emotions. A tapestry is not just a picture. I see so much more hidden in it. 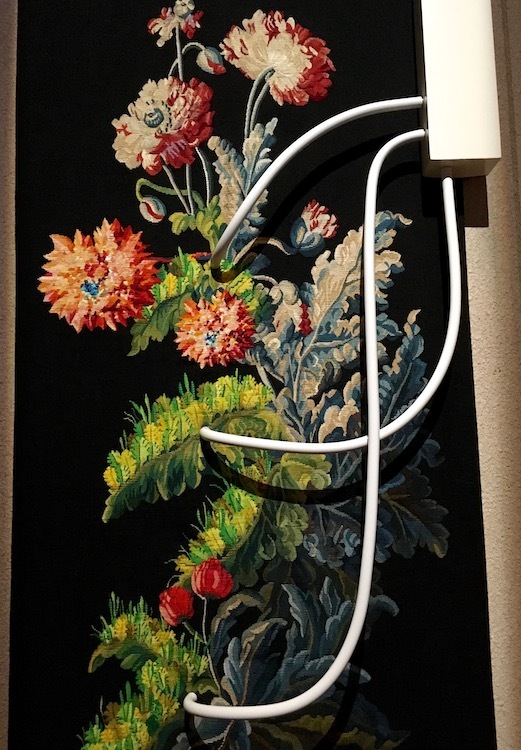 It also says a lot about the personality of the designer of the tapestry: may it be someone who is a romantic at heart, goes along with the flow, or is, on the contrary, very open to new, and maybe even extreme experiences. I was looking forward to the time when I could actually weave my first tapestry and I generated various ideas of how to do it because, after all, it was a sacred thing and I had to put my soul in it. When the time came, I based my tapestry on what was currently going on in my life, my emotions and overall possibilities. I also had to take the time limit into consideration because as you may know, tapestry weaving is quite time-consuming. This is not a bad thing in itself. I would only be able to fully enjoy weaving a more complex and time-consuming tapestry if I knew that I didn’t have any other responsibilities at the same time and this would be my main job, so I didn’t have to worry about anything else. I think that you need to make time to weave tapestry and take it as a meditative activity which you can enjoy. Although I’m quite an impatient person and want everything to be made quickly, I like weaving tapestry. It’s a good time to concentrate on one thing at a time which is difficult to do in our information-rich lives today. But time limit also has its pluses. It makes you think about ingenuity. Often new ideas of weaving methods and use of materials are born. My tapestry “Legend” was made as a school assignment. I connected the topic with a person who is a legend in the world and who had influenced my own personality quite a lot at a certain period of time. This topic touched me at a personal level and brought this work very close to my heart. Personal connection to a topic is actually something that I consider to be essential when I’m designing any bigger and more important work. 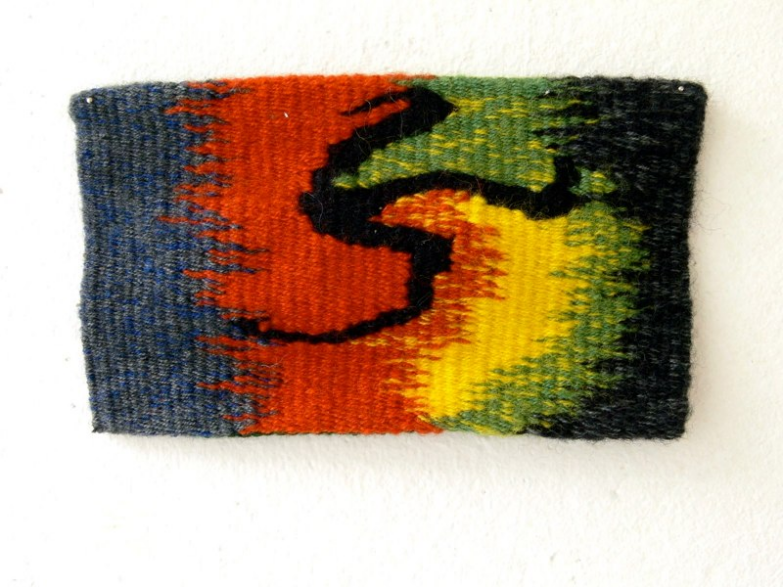 This made each and every step in the process of tapestry weaving important. It was also important to weave it myself so that the work could be woven with the right emotions, which maybe only I can sense, but which I consider to be important enough. What attracts me most in the world of tapestry is the use of unconventional techniques. Since I generally love different printing methods in textile design, I decided to connect my tapestry with this technique, which is also a way of self-expression that reflects my lifestyle. I used transfer print in my tapestry. The fact that I connected my favourite printing method with this work made the whole process even more enjoyable. Experimenting in itself was exciting and I was also able to experience life in a testing laboratory. It was funny that I only made some tests to weave tapestry and for that I needed a respirator and a pair of rubber gloves. One way of printing was to put the tapestry through the printing machine but I thought that transfer print gives a more unique result and there is always room for surprises. Some spots are clearer and some more dim but this gives the work its own little charm. I don’t go for a perfect result, which seems a bit clinical. I rather cherish quaintness which leaves room for fantasy. I love to leave things up to chance from time to time because it makes the process more exciting for me. It is not only the execution that is important when making tapestry, but the whole process ‒ creating designs, experimenting, and finding the best method to make the tapestry ‒ everything that one needs to do before weaving. I could say that the process is even more important to me than the result but the result should also be good. Although I’d prefer to use unorthodox methods and materials, I also cherish the history of tapestry which even influenced my own work to some extent. I use classical takes or forms that work well even when I make my other works, but I mix them with contemporary techniques. It would be great if these two aspects could be joined as it would create the element of surprise. I don’t conform to certain rules but I still think it’s important to preserve the traditional features of tapestry which, so that I could classify this work as tapestry. When it comes to the tapestry “Legend,” I also wove a traditional surface with different yarns to get this meditative joy of weaving and then mixed it with the printing method – that was exciting for me. Combining different techniques and materials is a very welcome past time for me. I believe that there are no limits when it comes to materials. As long as there’s fantasy and a desire to experiment, there should be no limits. When using a print, you have to take into account the limits that come from printing, but I believe that you can always overcome these ‒ you just need to find a way. Finding that way is for me one of the most interesting steps in making tapestry and this is followed by the prize ‒ starting to weave the final work. It’s important for me that the topic or the execution of the work is apt, witty, ironic, or simply heart-warming. The work should also carry some message so that it would provoke emotions in the viewer or make the viewer think about a certain topic. That is when the work of art has given its contribution. I used this aspect in my tapestry, too. It could be seen as a form of kitsch, so that the work of art would appeal to bigger audiences, but it does not bother me. I like to connect my work with my own feelings and experiences but I like to express it clearly and not to go too deep with the execution, as it may only be understandable for me and remain a mystery to others. Sociability is an important keyword for me. 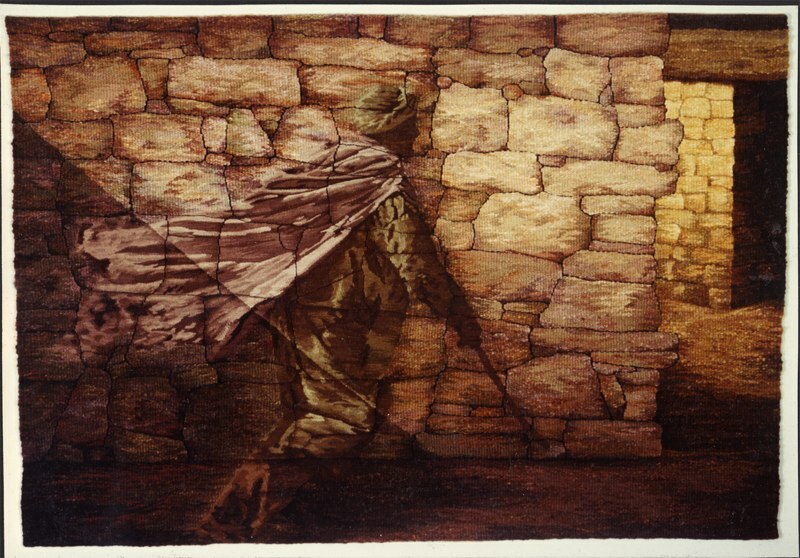 I used quite a topical theme in my tapestry “Legend,” and that is the print. My goal is to address as many people as possible and not only the experts in my field. 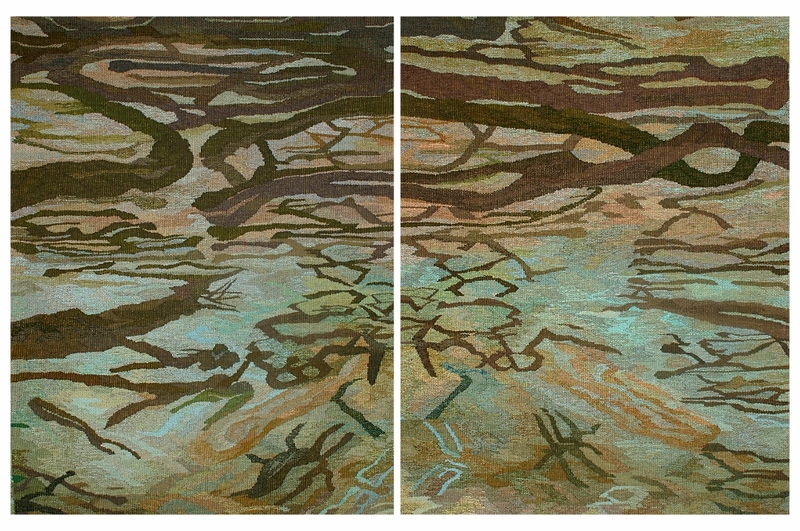 My work is connected with positive memories or emotions, so I didn’t want the tapestry to give a heavy impression. I depicted my work simply and clearly. I do not consider myself to be an artist. An artist for me is a person who has art as his or her main job and lifestyle. I’d like to move in this direction myself. However, I think my works are pieces of art. It’s easier to define one work as art. If there are emotions, feelings, and thoughts in the work, then I see it as a real work of art. I’ve exposed my work in different exhibitions and I think this is also important. You should definitely not keep your work hidden, but rather give it a chance to spread your message and maybe even sell it. If I want to sell my work then I have to think about it before I start making the work and then take the aspects that connect with it into consideration. If I’m making something very personal then I don’t think about selling and I don’t sell that work even if somebody would like to buy it. We should exhibit tapestry not only in art galleries but somewhere in the public space which is even visited by the so-called ordinary people to promote tapestry more around the world and to destroy the opinion that tapestry is an ancient and boring art. I’ve also thought that tapestry weaving could be a part of the arts and crafts programme at school. What engages children is the small opportunity for invention so that you can make something new and unique by using some of your favourite techniques, materials, or a topic that speaks to you, and then come up with an idea on how to weave it. Children dig the idea of inventing something. If it is in my powers then I would like to implement this idea in the future. 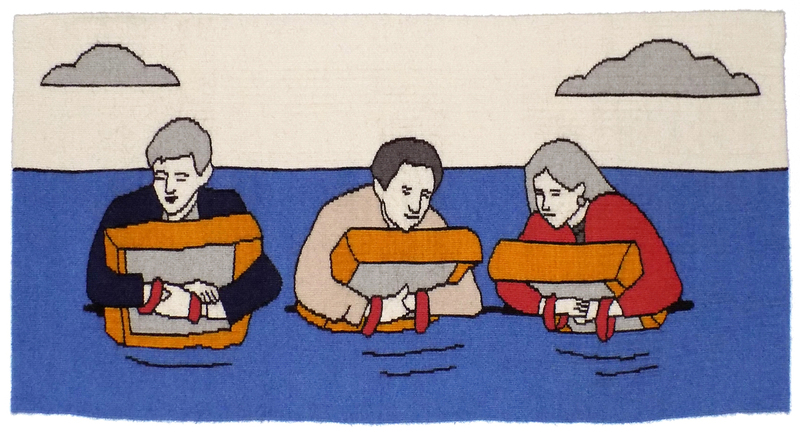 I think that tapestry weaving is a very good way of self-expression and it can be a very fun activity. Birgit Uibo is 26 years old. She lives In Estonia. She graduated from Tartu Art College in Estonia, studied textile design. During her studies she had the opportunity to participate in many fashion projects that are her passion as well. In the summer of 2013 she worked at Luan By Lucia fashion house in Hungary as a trainee. Before Art College she studied Art and Design at Kuressaare Regional Training Centre. During that time she had a good opportunity to work in Estonia National Theatre and Vanemuise Theatre, apartment of decorations as a trainee. These experiences influenced her to include more theatrical feelings and elements. Her creation can be defined as minimal, multifunctional and humorous. Her passion is to combine classical cuts or materials with new techniques. She is interested in different printing methods. Currently she is focused on digital printing fashion.